Qura’an in hand and Heart and shariyah in their actions, Beliefs talks and deeds. They were the mobile were encyclopedias of Islamic knowledge and shariyah personified. One of the dignified personality of the 17th century who migrated to Bijapur from Ahmed Abad Gujarat and made the land enlightened with his grace, mercy, preaching’s, blessing and prayers, Not only to the people of the time but to the people who visit his tomb with great love devotion and belief. 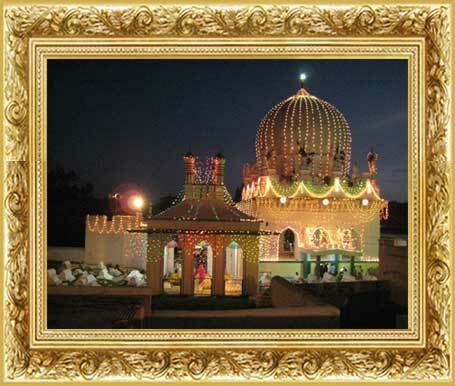 Whose tomb is situated to left side of the famous historical monument’ The Golgumabaz ‘ of Bijapur which in itself is the magnificent proof of the great merciful deed of the saint, Qubute-Deccan ,Hazrath Hashim peer Dastageer , Rehmatullah –Alaih .It was his grace that he rendered his precious 10 year of life to the king Mohammad Ali Adil shah IInd’ so that he can complete the building of Golgumaz,Who was very ill at the time and was near death .Hazrath Hashim peer Dastagir was born in 948 Hijri at Burhanpur in Gujarat in the Sayed Sadath family, The direct descendant of Martyr of Karbala Sayedina Imam Hessian son of Hazrath Ali (R,A) and Fatima (R,A) The great pious daughter was Mohammed (S,A,W,S) his father was Hazarath Sayed Shah Burhanuddin Hussin Alwi Ahmed Abadi. Who was the great saint of the time, a noble, laureate and a very Rich Zamindar of the time too. Harath Hashim peer Alwi (R.A) was a born saint, He followed the path of the prophet in his birth by losing his mother and was called orphan .He lost his mother seen after three hour of his birth .A young girl who was virgin feeded him, as he wasn’t ready to be fed by any lady who was married and had delivered their babies .The girl use to feed him with wazu, else she couldn’t feed him. He was educated in Basic Islamic principles and reciting of Qura’an and hadith by him own father Sayedina Burhanuddin Hessian Alwi (R.A) After learning the fiqqah and tafseer (Qura’anic commentary) from his father for long 16year .He practiced humbleness, Humility, hunger, fast, and darweshi according to the will of his father following the path of his great father Sayedina Hazrath Mohammed the prophet of peace (S.A.W.S) After the death of his father and according to his will he reached Ahmed Abad where he met this cousin (paternal uncle’s son) Harath Sayed Shah Abdullah Hussaini, Who was the great Fakeer and Sufi Saint of the Time .He served him honestly and got mystic realities and wilayat (Sainthood) through his blessings his own cousin and preacher. He was advised to march towards Deccan by his Murshad (preacher). He arrived in Bijapur during the virgin of Ibrahim Adil Shah 2nd in 1506, to 1607. According to Richard Max well Eaton” When his father died in 1605-06 he gave away this family fortune including the village in ina’am, He left Ahmed Abad inexplicably for Bijapur. We hear Nothing of Hashim peer’s activities in Bajapur until the end of Ibrahim IInd reign when event following Pilgrimage to Meccah brought him into the close contact with the court . He accepts that “It’s likely that Sultan wished to show his support for a man already widely renerated as a living Saint in Bijapur”. 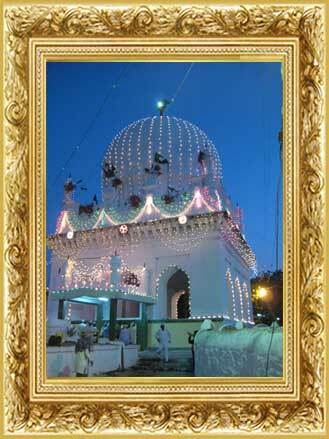 read many miracles of Harath Hashim peer in his later life. He was 73 when Mohammed Aadil Shah started constructing Golgumbaz, he fell seriously ill. All medications failed. He approached Harath Hashimpeer to pray for him Hazrath looked at him and Harath looked at him And found with his inner knowledge that death of the king is very near, So to show the gratitude to his father Ibrahim Adil Shah IInd who helped him to get released from Portuguese jail .The saint said your father has helped me lot to get out of the Portuguese prison I owe to that and in gratitude I give away my 10 years remainder life of mine to you and take your death. 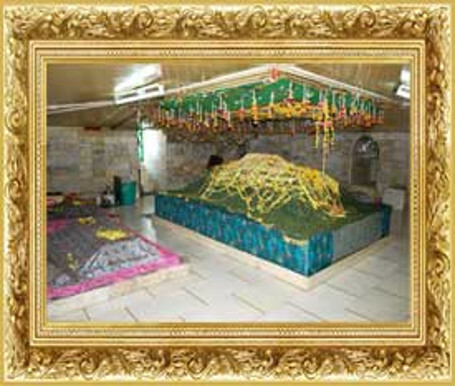 Thus the saint took his death on him and left this mortal life world on 7 of ramdhan 948 hijari 1646 AD he was buried in the present dargah .Which is now famous all over India today for the devotees of al religion .His urs-e-shareef is conducted on the same day every year.